Craft a meaningful life story! A written legacy of your life--one that encompasses experiences, lessons learned, failures and triumphs--is a gift your family and friends will cherish for years to come. Writing this story may seem daunting, but it doesn't have to be. Writing Your Legacy is a step-by-step guide to chronicling a life story that reflects your true self. Through a series of 35 guided themes, as well as supplementary exercises, you'll explore milestones, relationships, career paths, and major choices, and leave an eloquent record of your life for future generations. Writing your life story can grant you insight and clarity, help you heal past wounds, and serve as a treasured account you'll be proud to share. Your story deserves to be told. Capture the spirit of your life with Writing Your Legacy. As a life writing teacher at seniors centers and other locations, I collect and evaluate as many books on autobiographical writing as I can. I now have two texts I recommend to my students, Daniel Taylor's Creating a Spiritual Legacy for those who want to focus specifically on passing along their values and this book for everyone. It's not only a great introduction to the practical concerns of life writing, it is also packed full of questions to stimulate memory and thought. I use the questions contained in the book in nearly every class i teach and my students love them. They often comment how the questions elicit memories they haven't though of in years and how they give them a new and deeper perspective on their life experiences. A useful, motivating resource for anyone who wants to write a life story and particularly for those who feel trepidation, overwhelmed by the perceived size of the task, or just can't figure out where to begin. Among the full complement of memoir-writing tips offered here are clear, specific guidelines for getting past the internal roadblocks that prevent so many of us from starting and, once started, how to stick with it. The book is firmly rooted in the highly-regarded Guided Autobiography method, developed nearly 40 years ago by gerontologist Dr. James Birren to help people write the stories of their lives. Richard Campbell & Cheryl Svensson expand on Dr. Birren's method, sharing the accumulated insights they've gained through years of facilitating Guided Autobiography groups. A collection of ten life "legacy" themes (e.g., Forks in the Road, My Family, My LIfe's Work, From Secular to Spiritual, etc.) make up the heart of Dr. Birren's method and of Campbell & Svensson's book. Combined with accompanying probing questions, they provide writers with both a point of departure and a way to dig deeply into their pools of memory. The two-page rule is another core principle of Guided Autobiography. Writers set out to compose just two pages--approximately 1000 words--on each legacy theme. Suddenly the task of writing a life story becomes achievable, for it has been divided into ten manageable two-page chunks. It also becomes more interesting, for the themes and two-page rule encourage writers to relate stories abut "life moments" as opposed to an event-by-event life chronicle, guided by a timeline. So what have Campbell & Svensson added to Dr. Birren's highly-successful method? Plenty. After years of experience and insight gained through leading Guided Autobiography groups, they take their expertise beyond their classrooms to share it with a wider audience. Working from their deeply-held conviction that everyone is a survivor and has a valuable story to tell, they serve as encouraging companions, gently guiding the writer, one two-page step at a time. "But I'm not a writer!" Yes you are. You have a story to tell. Campbell & Svensson offer a plethora of simple tips and activities to help you get the writing juices and memories flowing: silencing the internal critics; using the senses and details to immerse your readers in your story; using humor; finding your voice and the right tone; avoiding clichés, crutch words, and overuse of adverbs; interviewing family and friends to fill information gaps and learn other perspectives; how to deal with thorny issues; portraying others. I particularly like the chapter that discusses the challenges of writing a story in which the author is the principal character. If you find you need the motivation and accountability that comes with a writers' group, you will find suggestions on organizing a Legacy Writing Club in the Resources section of the book. "I've written on the ten themes, but there is so much more to tell!" No problem! The book supplies you with 25 additional themes and guidelines for creating your own. You can write forever! "It's finished, now what do I do?" Great! Congratulations! There are chapters devoted to editing how-to's, organizing the content & adding final touches, and printing. While concise, this is a complete "step-by-step guide to crafting your life story" for it includes all the steps, from getting started to "uncorking the champagne". It's an excellent, practical addition to the ever-burgeoning body of memoir-writing manuals. As you consider writing your memoir you will most likely want to consult several guides; be sure this is one of them. I have never written a review on Amazon Books before but am compelled to write one now in praise of this excellent book. It is beautifully, skillfully, and wisely written, and I love the ease of it all. It is a fitting tribute to Dr. James Birren's vision for creating a deeply personal and meaningful life history, one story at a time, through Guided Autobiography. This highly readable book updates and modernizes the themes, descriptions, and probing questions, introducing the time-proven process of Guided Autobiography to a much broader audience. Our lives are full of stories. If you would like to create an enduring gift for family members for generations to come, buy this book and start writing down the stories of your life, a few pages at a time. That's all it takes to get started. You will be amazed at how enjoyable and meaningful the result can be! This review is being given after utilizing this volume within a Group Guided Autobiography (GAB) program for those individuals asking for more to write about, while still sharing their stories in a group setting. The particular Group which utilized Writing Legacy has been meeting together for up to 4 years at intervals of up 8 -16 weeks at a time. They all and the instructor thoroughly utilized this book. 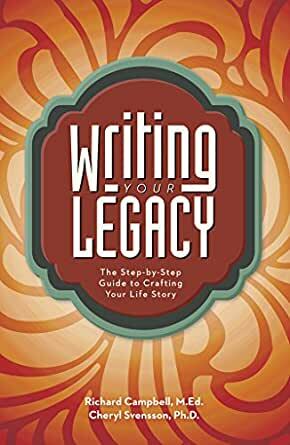 Writing Legacy was mentioned by many "as a good starting platform for the beginner and a great filler in for the more advanced biography writer as well." Richard and Cheryl did a phenomenal job in covering many areas within one book to aid many people to achieve a biography or Legacy of their own. Thanks to you both for a job well done. From a member of the Association of Personal Historians and Certified Guided Autobiography Instructor (Birren Center) - Lori Jurgiel, MA, CMC and her entire class from Webster Groves, MO (Saint Louis area).